One year ago today (technically tomorrow, but it WAS a Friday, so why break with tradition?) I completed this comic after nearly 5 years of work, and at the time, I did not appreciate it. I was intensely burnt out, frustrated with my work ethic and productivity, and had a bundle of life experiences and losses I could tie to specific pages and chapters. Rereading the comic was too painful, because I couldn’t see it for the original message – I could only see 5 years of my life, reduced to the worst parts, the ones I recalled the most harshly. A year ago, I wasn’t sure if I’d ever feel any differently about The Muse Mentor, which seemed a shame, but didn’t necessarily take away from what my original intentions were; that if anyone read it, maybe they’d enjoy it, and with a HUGE amount of luck, maybe they could even take something away from the message. Anything else was icing. For a long, long time, I didn’t feel like I was writing The Muse Mentor for myself. I felt like I was writing it for some nameless, faceless person who maybe needed it. I could only hope they’d find it. Well, I’m back here today to tell you, I reread my own comic, in its entirety, and not only did I enjoy it, but I could finally process my own advice. When I wrote it, I didn’t ever in a million years think I was writing it for me. I really thought these were observations I already knew. I mean, I wrote them! But now, freshly settled into a new home, in a new place, finally making sense of my future and coming to terms with my past… I actually needed my own advice. I get it, now. I get it better than I did when I first put it down on the page! So, at the end of it all… I did write The Muse Mentor for me. How ’bout that? More than that, I read, and I mean really read the comments. I can’t tell you how happy they made me. There was real, legitimate joy, there. I’m sorry I am so late in telling you so, but if you ever left a comment, thank you. I had a blast reading through them and was smiling pretty much the whole time – what a gift! Anyway, all of this made me feel I should give a little update for you on the characters, which you see above! Being honest, I miss them. I think now, more than ever, they deserve to be in print… so I am seeking a publisher to hopefully make that happen. I have already begun reformatting and improving past pages to be better on paper, but of course, I can’t change TOO much… how else will you be able to see all the growing I did throughout? If this is your first time here, I hope you’ll go back and read through! It’s 180 pages of a quick story about tiny but important successes. If you’re back again after a long time, welcome back, and thank you again. For everything. I still occasionally receive mail or messages from people saying this comic made them start a project or otherwise make an important decision or change in their life, and that is such an incredible thing. I never would have imagined! If you are one of those people, or if you ever become one of them, I am so grateful for you. Go be happy! You deserve it, and you can do it. At last, I’m right there with you in believing that. I can’t wait to hopefully share good news with you about a print run, very soon. 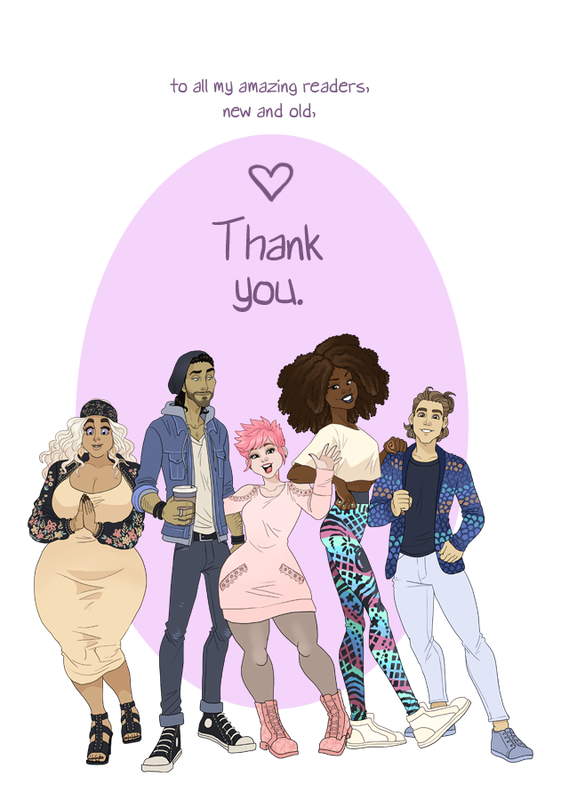 Thank YOU for such a lovely post after a year of this lovely comic being complete! I know during the process of its story I personally connected with its themes quite a lot, and eagerly awaited each update. When it finished I was thrilled, because a complete comic is such an accomplishment, and I wished at that time I had it in print. I read a lot of webcomics but I simply don’t have the money to invest in them all. But I sincerely wish you all the best with seeking publication for “The Muse Mentor,” because I know I will be throwing my money at it as soon as it’s available! It needs a place on my bookshelf. If you can say that you did it for you, then it came from the heart — and it sure shows. Thank you for sharing this dream with us! Ohmygosh I’m really looking forward to the print run! I’m also really glad that you were able to enjoy your webcomic again. I did not know you had those feelings toward your webcomic towards the end… BUT! I am so happy to hear that you were able to reread it and figure out that you were writing it for you. As I mentioned in older comments, this comic is one of my absolute faves, and you can be assured that I’d buy the hell out of a print copy of this!!! I like how everyone is looking at the readers except Esteban. I wish I could’ve been with the others while reading this wonderful MUSEterpiece. Thank you so much for this wonderful comic. Love it to bits. I know what you mean about tying life-changing events and losses to specific chapters/pages – I do it too, maybe everyone doing anything does it, but keeping going despite of that takes courage. And it's great that you can enjoy your comic now, maybe it always takes some distance and writing is like time-travelling, leaving messages for your future self to see. And that's really cool.